Happy New Year, folks! I missed yesterday, but today I did a little something different for the first card draw of the year. 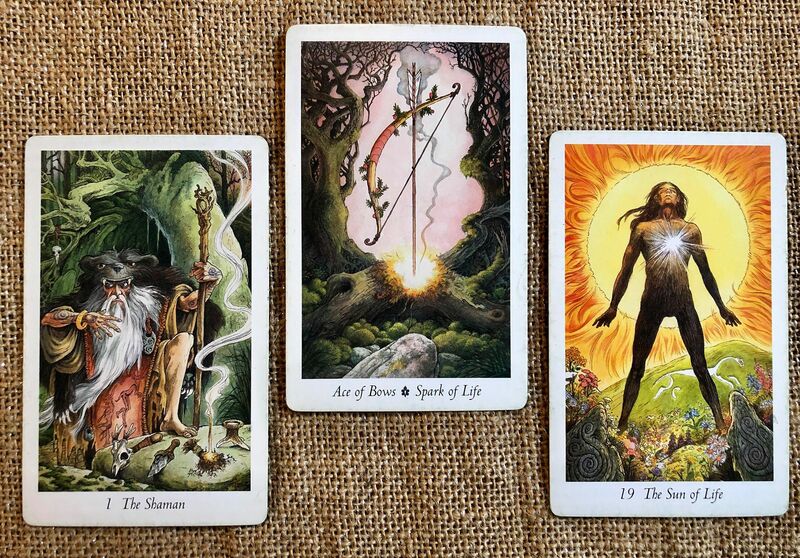 Whereas I typically draw three cards and post the one that feels strongest for that day, today I’m posting a spread: (left to right) the spiritual (The Shaman), the mental (Spark of Life), and the physical (Sun of Life). Given what I drew, this is a potent spread! 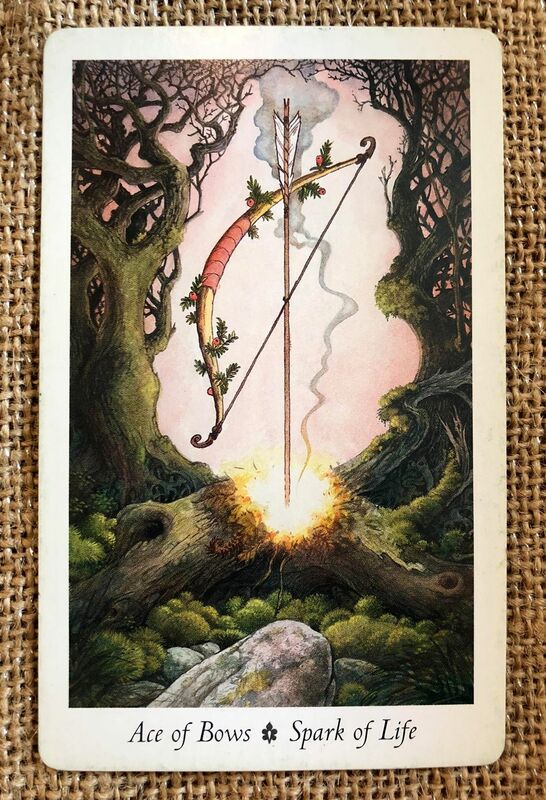 Overall, my feeling is that we are being guided to our primal spiritual selves and encouraged to put our energy out into the world instead of being reclusive and hoarding energy. I don’t know about you, but I felt like 2018 was about getting through it. No more! Now is the time for action and to not let people or societal norms hold you back. This doesn’t mean to be haphazard; indeed, act on well-considered plans. (Don’t we all have them tucked away?) Get healthy, learn the skills you need, take care of yourself and your loved ones, and be mindful. But DO. Read on to learn more about each individual card. Blessings! Reading points: You may hear the beat of a drum or the song of the wind. It may be the dancing of the light on water or the midnight barking of the Fox, but whatever awakens your desire to return to the wild, the shaman within you is ready for initiation into the mysteries. This may manifest itself in the form of desire to study and esoteric science or philosophy and apply what you learned to the world. It may involve travel for the sake of getting confidence and experience. But however the desire to begin a new spiritual chapter emerges, you are now in an emotional and intellectual position to bring forth a real change in your life for the benefit of everyone. This process of focusing, mediating, and applying wisdom from the Otherworld to everyday reality is the true work of the shaman. This is a gateway card, offering illumination to the labyrinth of the inner universe end of the Otherworld of the universe online. The shamans unique quality is the ability to enter and commune with all levels of sentiment life on the earth. It is he who shutters with the wisdom and joy contained in the haunting music of the whale song or who skin pickles with arousal at the howling of the Timberwolves. His soul reverberates with the unheard sonorous call of the mountains and smiles with pure joy at laughter of the waterfall. The shaman applies his magic with intent. He studies the habits of wild creatures; he understands the weather patterns that bring good harvest or dry summers. 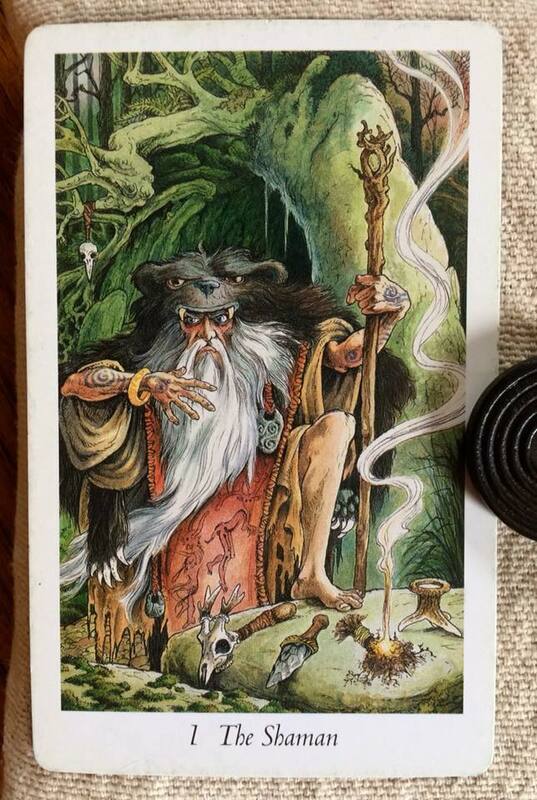 He knows the healing plants from the deadly fungi and can travel through the dark by watching the ritual dance of the magical beings that populate the night sky. He give thanks to the trees that supply warmth and light in the winter and gathers young around fire to told stories of great adventure and courage to the light and educate those who would listen. 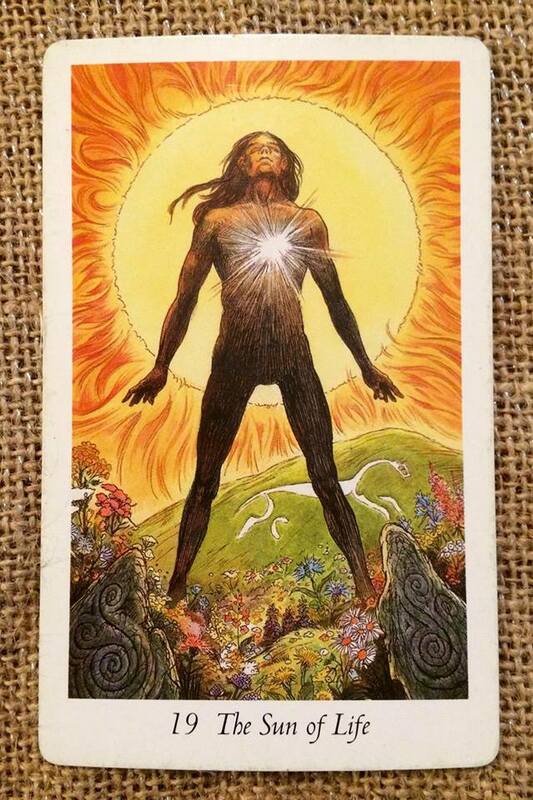 Through inner working and meditation, the shaman will bring inside and understanding of your true place in the world. Then practical application and the manifestation of wisdom and will power into your physical world is possible. This requires dedication, patience, and commitment, but is the nature of real magic.